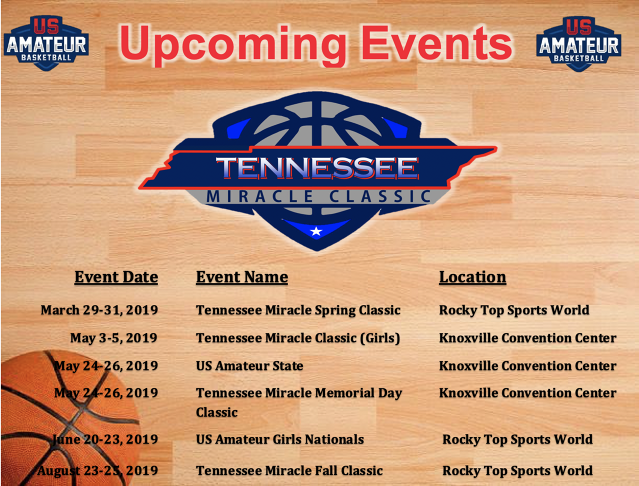 2019 US Amateur State/TN Miracle Memorial Day Classic May 24-26 !!! ALL TEAMS be prepared to play by 4:00pm Friday May 3 for the TN Miracle Classic. If you know you will be in town early Friday please let me know NOW, otherwise teams will be selected randomly. 30 teams play each round. ALL registration forms are needed now. NO coach's passes will be issued without registration form submitted with coach's name listed on form. No coaching changes at registration. If you are playing in the TN Miracle Memorial Day Classic or US Amateur State Championship May 24 you need to book your hotels NOW they are selling out and will be gone soon. We have had a great response for boys & girls!!! US Amateur State Championship has added boys 2nd grade!!!! Register your team today for an opportunity to win a Championship Ring!! Knoxville Convention Center is an awesome playing site offering 15 new courts under one roof and hotels connected to the playing facility or within walking distance so you can walk from your room to the courts. 75 restaurants within a mile radius. It is also the home of the Women's Basketball Hall of Fame and a short drive to Pigeon Forge and Gatlinburg. Rocky Top Sports World is a state of the art sports complex with 6 courts under one roof and 4 more within walking distance. It is also minutes away from Pigeon Forge and downtown Gatlinburg where you can always find entertainment for all ages. Click on Hotel Info to book your rooms!!! ALL EVENTS are stay to play and rooms must be booked thru the selected hotel links. We greatly appreciate your compliance as it helps us to offer EVERYONE the best prices possible!! See below info for all tournaments - Discounts offered for multi-teams and multi-tournaments!! 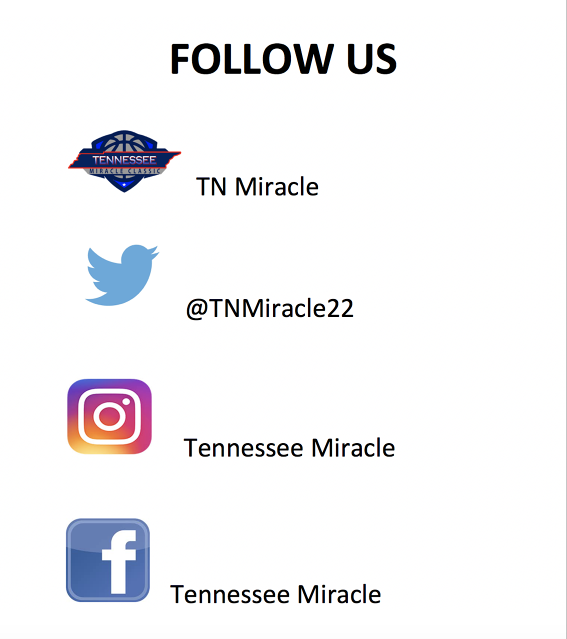 Tennessee Miracle and US Amateur Basketball Events Where we strive year after year to offer you the best tournaments in the Nation for 18 years !!! 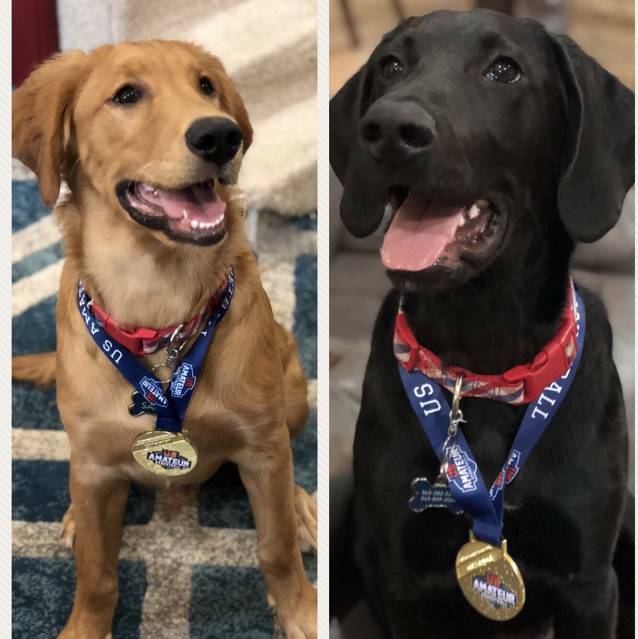 ***Free US Amateur membership for all teams participating in this tournament - good for all 2019 events ***Sold out early last year with 188 teams participating from multiple states Gold - Silver - Bronze divisions Awards - Medals for Champions and Runner-up - Register ASAP and get qualified for Nationals !! 188 TEAMS PARTICIPATED LAST YEAR- REGISTER EARLY!! **Great event 193 teams from 12 states participated last year including National Champions and top 10 teams in the Nation - now offering lower divisions for teams not ready for this level of competition- Awesome event where the best teams in the Nation meet and lower caliber teams ALL have a place to compete!! ** Awards: Medals for Champions and Runner-up - Register your team while space is available !!! Over 150 teams participated last year from multiple states and we have already registered more teams than last year!! Going to be a great event!! Awards: Medals for Champions and runner-up in each division !! Register today for a great tournament !! $200 discount for champions in each grade to attend Nationals!! Over 150 teams already registered !!! **Registration deadline May 13** If you missed the other events because they were sold out, register your team now before it sells out. This will be an awesome event!!! **Great tournament last year with teams participating from Minnesota to Florida and everywhere in between** Championship Rings - Divisions 1&2 Medals for runner-up teams - Opening Ceremony with Special Guest Speaker - Individual Competition - DJ "Sterl the Pearl" former University of Tennessee quarterback/pro player current UT football DJ , a fantastic entertainer, will be returning to emcee opening ceremonies - Awesome event last year, we want to make it possible for ALL teams to participate so we lowered the price $100 and we are offering a $100 discount to ALL State Champions in ALL States - see your state website for more info coming soon!! See the above tournaments for more ways to receive your $$$ to attend Nationals !! Knoxville Convention Center is an awesome playing site with 16 courts under one roof!! Hotels are either connected to the playing site or within walking distance so you can walk from your room to the courts!!! Knoxville is home of the Women's Basketball Hall of Fame and is also a short drive to popular tourist cities, Pigeon Forge and Gatlinburg! Rocky Top Sports World is an awesome complex with 6 courts in the same building 4 more within walking distance. everyone young and old - Gatlinburg & Pigeon Forge !!!! WE PROMOTE AND ENCOURAGE A CLEAN AND HEALTHY PLAYING ENVIRONMENT FOR ALL TEAMS TO HAVE AN EQUAL OPPORTUNITY TO COMPETE - COME SEE FOR YOURSELF!!!! Hotel info for all events is posted!! Click on hotel link on the right side of page for more info and to book your rooms. All events are stay to play which means ALL teams needing lodging are required to book through the hotels selected for each event. Coaches please advise your parents if they walk onto the court for ANY reason during a game they will automatically be removed from the gym. No warning will be given. If you are removed during another game your player will be removed also. If your child is hurt the referee will call you to the court. If wristbands are removed for any reason they WILL NOT be honored or replaced for any reason, do not ask there will be no exceptions for ANY reason. There will be no discussion with tournament staff for either rule. Parents it is your responsibility to tell your child to not remove them. Coaches please ask your parents to refrain from yelling at the referees, they may not agree with the refs calls and they may miss a call but have you watched the NBA lately? They are missed there too and we are far from that level. Concentrate on cheering for your team and let the coaches and referees do their job. Looking forward to a great exciting weekend!!! Rocky Top Sports World - Gatlinburg, TN - 10 Courts within walking distance (6 under same roof) Awesome NEW playing facilities minutes from downtown Gatlinburg and Pigeon Forge, but out of the main traffic routes. Knoxville Convention Center - an awesome playing site with 15 courts under one roof, hotels connected to the facility or within walking distance so you can walk from your room to the courts. Home of Women's Basketball Hall of Fame and a short drive to Pigeon Forge & Gatlinburg. For all tournaments you are guaranteed 3+ games and in most tournaments all teams advance to bracket play so you get more games than the guaranteed amount. US Amateur Nationals you are guaranteed 5 games. Our fees might be a little higher than some other tournaments because we offer a professionally ran tournament with NO running clocks, state of the art facilities all on the same campus within walking distance, we furnish book & clock personnel, referees from several states, gatorade for all players & coaches,and in most tournaments you get more than the guaranteed amount of games, and we promote and encourage a clean and healthy playing environment for ALL teams to have an Equal opportunity to compete!!! Come see for yourself !!! Please fill out SCORESHEET (under HEADLINES). YOU WILL NEED TO GIVE ONE TO THE BOOKKEEPER BEFORE EACH GAME!